Pompes Guinard "Forest Fire Trucks"
French pump manufacturer Pompes Guinard, established in 1920 and still in business as of 2017, expanded for a while into building fire apparatus. 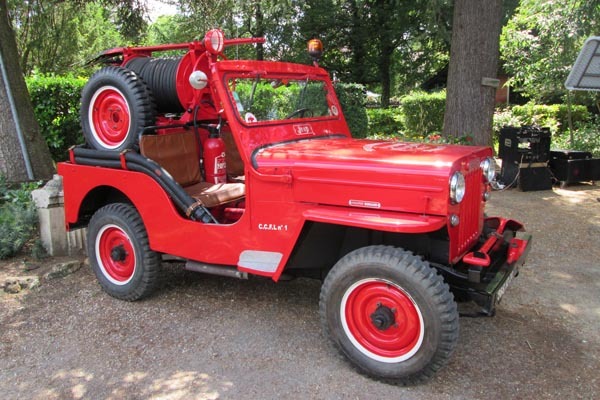 One of their products was a Hotchkiss Jeep conversion. CCFL no. 1 of Dordogne State Fire and Rescue, is a Camion-Citerne Feux de forêts Léger ("tank truck, forest fire, light"). This CCFL conversion was done by Pompes Guinard at their plant in Saint Cloud, a suburb of Paris. 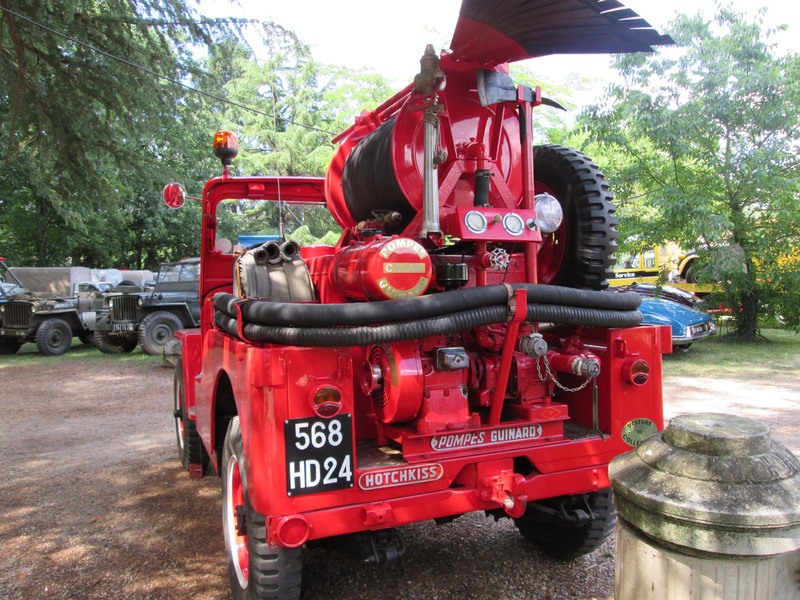 Like the similar "Light Tank Truck" built by Maheu-Labrosse in Lyon, this one has a gasoline-powered rear pump. 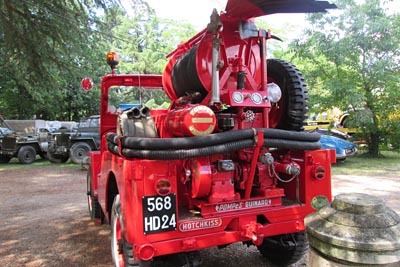 The spare wheel, normally mounted on the rear by Hotchkiss, is on the side of the water tank. 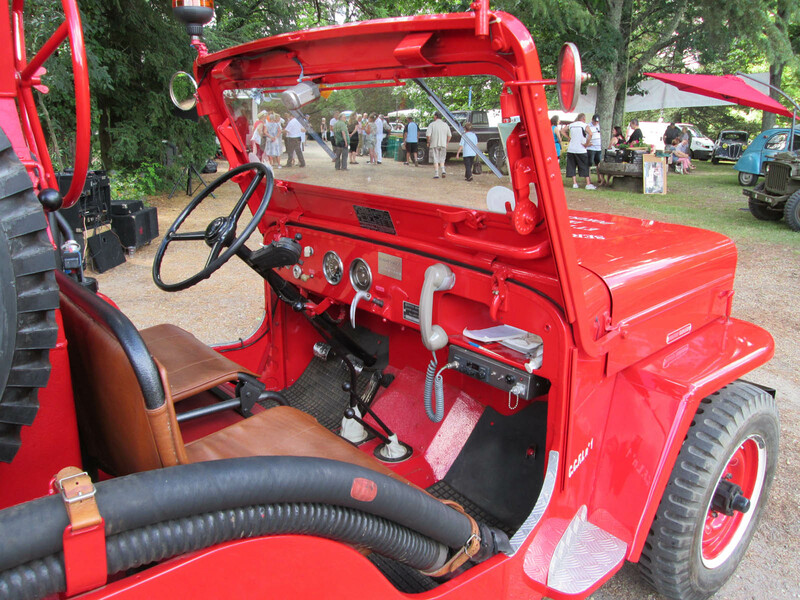 The retired Dordogne Jeep is radio-equipped. 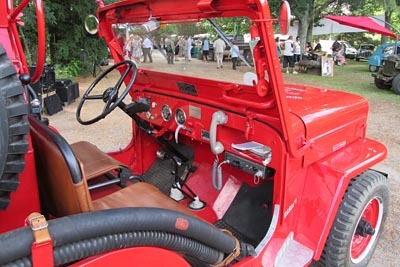 This photo also shows some distinctive features of the Hotchkiss JH-102 -- the sling seats and the twin speedometer and gauge cluster on the dashboard. See also a left side view (300K JPEG). 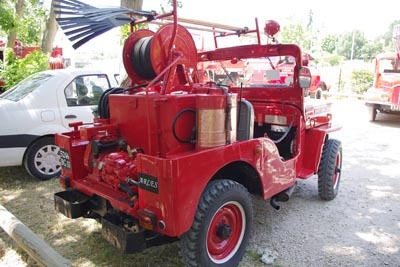 Pompes Guinard also did CCFL conversions on the earlier Hotchkiss model JH101, produced from 1955-59. 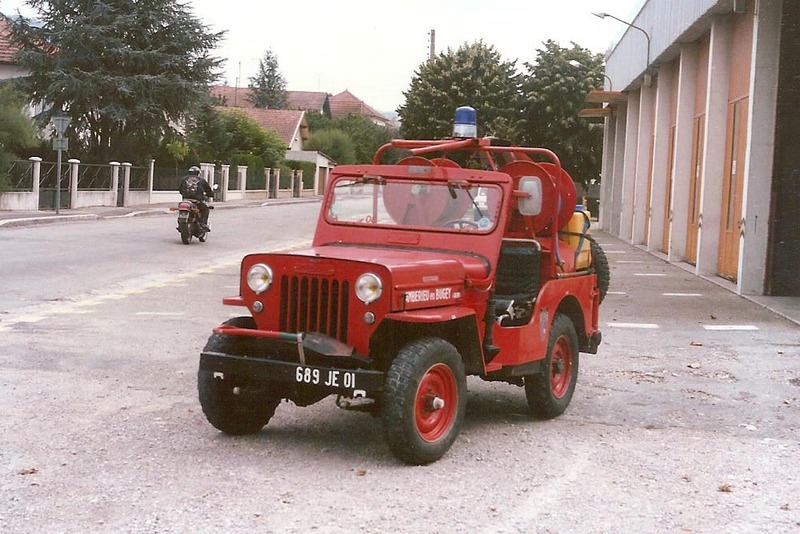 This one is lettered for the State Fire Service of Bouches-du-Rhône in southern France. In the background is an M201, the Hotchkiss clone of the Willys MB. Large water tank, and a nice copper backpack tank. 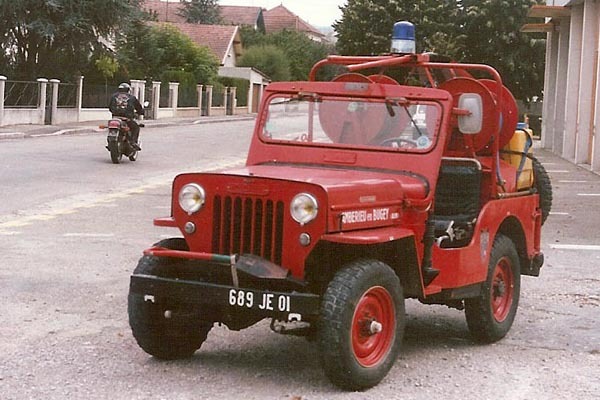 The Jeep apparently served in the city of Arles, which is located adjacent to large nature reserves at the mouth of the Rhône river. Photos courtesy of gde34 at autotitre.com. This drawing is the centerfold illustration from a colorful and informative double-fold brochure (120K JPEG) for the CCFL Jeep by Pompes Guinard. It shows the low-pressure version with a 250-liter (55 gal.) tank and a single 80-meter (250 ft.) reel of 22mm (1 in.) hose. It also shows a rear-mounted spare. The high-pressure version has a larger 300-liter tank and two 50-meter (165 ft.) reels of 12mm (1/2 in.) hose. According to the brochure, the pump can draw from the onboard tank or from an external source, but the brochure illustrations don't show the Jeeps carrying suction hose. A spare wheel is also not shown. The back panel of the brochure includes specifications (180K JPEG) in French for both versions of the truck. It also claims a total of 260 Light Tank Trucks sold by Pompes Guinard in France between 1946 and 1962 (it's not clear if these were all Jeeps), as well as 244 Medium Tank Trucks. Here's the high pressure version photographed circa 1986, in service in Amberieu en Bugey. The town in the French Alps is an important railway junction and was a major center of the French Resistance during the Nazi occupation. Photo courtesy chrispit1955 on Flickr. 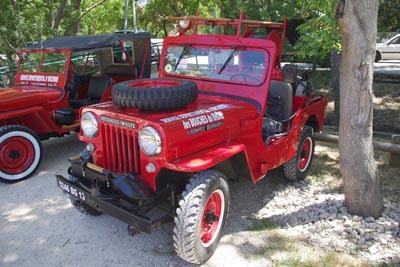 See Jeeps in France on CJ3B.info. 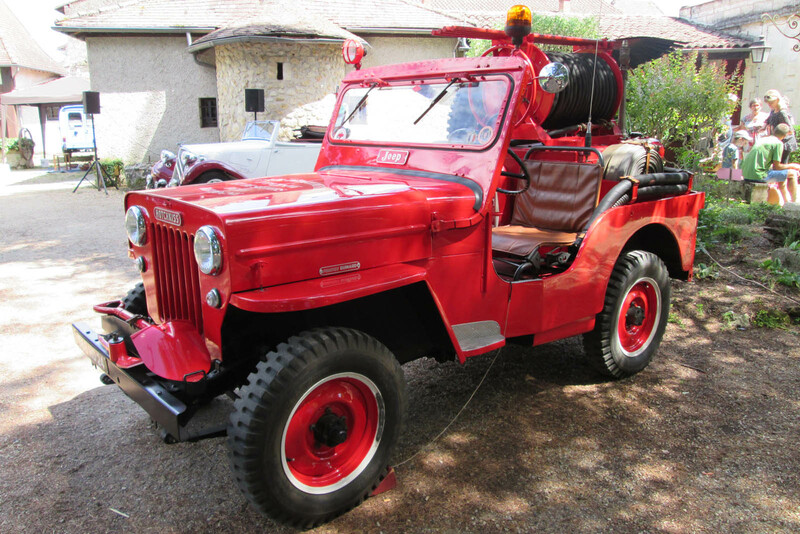 See more Hotchkiss fire Jeeps in CJ-3B Fire Jeeps Around the World.